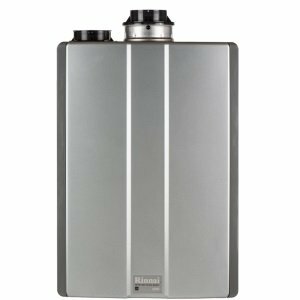 Do you have a problem with a Rinnai tankless water heater? Is there an error code on a remote control or unit's display and you need a hand to understand it for the successful troubleshooting? See what causes the unit malfunction and error message to display, and what you can do about it. Rinnai, as other manufacturers require professional installation, regular cleaning and maintenance for the proper water heating, great performance and long unit life. This article will show you the most common error codes and problems found in almost all Rinnai water heaters, non-condensing and condensing. Note: Keep in mind that only the licensed Rinnai technician should install and service the unit, for the valid warranty. An extensive knowledge and skills are needed for any gas, plumbing, electric and tankless work, so it is in your best interest to contact a licensed technician. One of the frequent problems many home-owners are dealing with, in on-demand water heating, is an exposure to hard water. The high concentration of mineral deposits in water is the main cause of the sediment build-up, especially in the heat exchangers. Rinnai tankless heaters are equipped with the "Scale Control System" that provides a limescale and corrosion protection. If the problem occurs, you will notice the error codes LC0-LC9. which represents the scale build-up inside the heat exchanger. Another problem associated with every tankless unit is the temperature fluctuation, associated with the unstable or low water flow. The fluctuation of hot water temperature usually happens when two or more fixtures are operating at the same time. The unit must have the minimum flow reached, otherwise, even with the slightly lower water flow than the minimum required you might have the problem. By increasing the flow rate, the problem can be solved. Troubleshooting Rinnai water heaters is much easier if they come with the diagnostic system. Units equipped with the remote controller such as MC-91-2 will provide the most recent diagnostic information and allow you to react immediately by recognizing the error code and following the troubleshooting guide. Again, the recommendation is to contact a licensed technician for troubleshooting and any work that needs to be done on the water heater. If planning to do it yourself, use the following suggestions carefully. Some of the error codes can be done only by the professional. Bath Fill function is disturbed after the power outage. You should turn the hot water taps OFF and press the power button twice to resume the Bath Fill. Check the venting system (both intake and exhaust) for the blockage. If there is no flame, use some of these tips for troubleshooting: check the loose connections and the proper voltage on the power supply, PC board, and igniter. Ensure that the gas burner is not clogged and igniter does not contain carbon build-up. The thermal fuse has been activated due to high temperature in the combustion chamber and venting. Ensure that there is no blockage in the vent system (lack of the combustion air). Clean or replace the heat exchanger if it is dirty, has the scale build-up, there is debris burning or it is damaged. Increase the water flow if it is too low. Over-temperature sensor reacts if the unit is too hot, so it shuts the unit down. Make sure that problems such as those found when dealing with the error code 14 are resolved. Make sure that the electrical grounding is properly done and there are no shorts. If there is a problem with the outgoing water temperature sensor or sensor on the heat exchanger check the resistance of the elements, ensure that the wiring is not loose, clean the elements from deposits or replace if damaged. The problem of venting or air supply. Ensure that your water heater gets enough combustion air and that the vent system is not blocked. Make sure that fan is operating properly, that a sensor is not damaged or wire connection lose. Check the resistance of the sensor. This code is found on the outdoor models only. Use the same approach as with other sensors above. Make sure that the valve coil resistance is OK and that the wiring harness is not damaged and connections lose. Ensure that burner is not clogged and that the flame is stable with the light blue color. Check the resistance of the fan motor, that it is turning freely and there is no damaged wiring or loose connections. Replace the water flow sensor if it is broken. Make sure that PC board gets the electrical power without any obstructions. If it is damaged replace the board. Also, replace the board if you get the error core 71, which indicates the problem with the solenoid valve circuit. Make sure that the flame sensor is touching the flame. If there is limescale build-up use the fine sandpaper and clean it. All the wiring should be without damages and connections must be tight. Replace the element if it is needed. Check the internal elements and plumbing for leakage. The error codes from the above were taken from the manufacturer instructions so troubleshooting Rinnai becomes easier and convenient for readers of this website. Keep in mind that the warranty does not cover the unit if the problems were related to freezing, water quality, flooding, fires, improper installation or handling. In order to provide a reliable and efficient long-term operation of your Rinnai water heater, have it installed by a pro. Also, to repair any of the problems such as those shown in the above error codes, a licensed professional should be contacted.